Spock. . 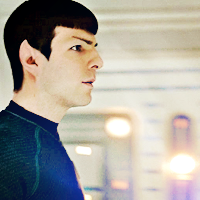 Images in the Star Trek (2009) club tagged: star trek 2009 spock zachary quinto. This Star Trek (2009) icon might contain tights, leotards, leotard, unitard, body suit, cat suit, legging, leging, and leg covering.